Mike eats solid state drives, smart phones, thumb drives and SD cards for breakfast. Did you know that Solid State Drives (SSDs), flash drives, smart phones and micro SD cards will literally fall through the cracks of most data destruction and recycling processes? 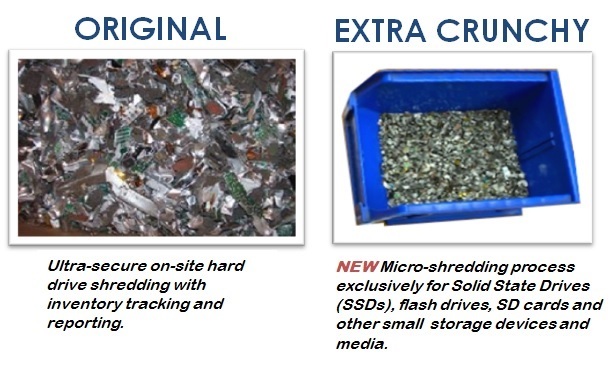 That’s why Securis has added a “micro-shredding” option that goes beyond traditional shredding and pulverizes devices into 2MM e-crumbs as shown in the photo on the right. As SSD’s proliferate and data devices shrink, enterprises need more than a traditional shredder to ensure full security. Unlike a standard hard drive shredder, the pulverizing action of Securis’ process renders all data illegible. 134.5 million IT assets currently sit idle in the U.S., and a scant 18 percent of these are likely to be recycled or securely disposed of. -Source: U.S. Environmental Protection Agency (EPA) For years, IT asset disposal has been considered a logistical and operational challenge. However, due to the explosion of data breaches associated with lost, stolen or compromised enterprise data storage devices—plus the introduction of Federal IT security, environmental and industry regulations—IT asset disposal is now a full-fledged element of the global cybersecurity and data security challenge. As such, the expectations and requirements of enterprises and government agencies regarding IT asset disposal must continue to shift. No longer will any supplier with a truck and a shredder satisfy requirements for security and environmental responsibility. Today, IT departments, business owners and operational and facilities personnel must ensure they are dealing with reputable, dependable firms with proven track records and a deep understanding of secure IT asset disposal and recycling. The truly qualified firm will have invested in critical elements including the secure processes, logistics and facilities necessary to deliver end-to-end security through the entire chain of custody of every individual asset. 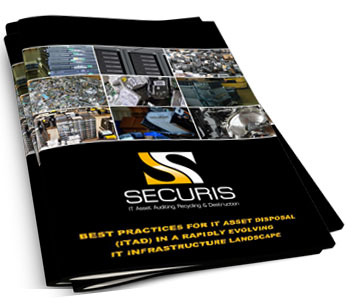 Securis has always understood the critical role of IT asset disposal in the data security equation—and has consistently led the market with innovations to improve physical and logical security, including on-site shredding, real-time auditing and reporting, video monitoring and recording, access controlled facilities. Interested in seeing our micro-shredder in action? We’re happy to give you a quick demonstration. We’ll even come to you. Shoot us an email and we’ll give you a call to set up a time. Copyright © 2019 Electronics Recycling, Data Destruction, Hard Drive Shredding All rights reserved.